I purchased the transmission cooling lines through Pure Choice Motorsports. Because I'm mounting the cooler behind the transmission and the cooling lines will need to fit as close as possible to the transmission, I decided to use banjo fittings at the transmission. The lines exit the transmission at an angle toward the front of the car because normally the cooler is under or in front of the radiator on a production vehicle. I've seen other street rods with the cooler behind the transmission and usually they run the lines forward first with a loop heading back. Not that there's anything wrong with this but I thought the banjo bolts would clean things up a bit. 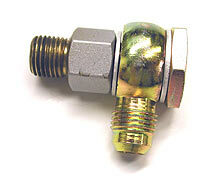 This is one of the fittings from the transmission. You can see the inverted flare at the bottom. 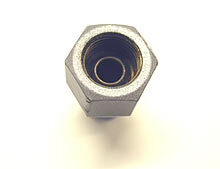 When the banjo fitting is screwed into the transmission fitting it hits bottom (the inverted flare) before the washers on the fitting have a chance to seal. The bolt is going to have to be cut down. We don't want it to hit bottom before the washers have a chance to seal. 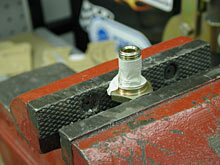 The way a banjo fitting works it this: The threaded bolt part is hollow and also has a hole drilled through the side. Fluid enters through the center of the bolt and exits out the hole in the side and into the large banjo-shaped chamber, where it then flows out into the hose. The compression washers on each side of the banjo chamber make the seal. I estimated the amount to be removed from the bolt and placed it in the vise and the excess was removed with an angle grinder. 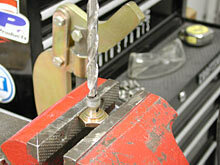 I also used a drill to ream out the end of the hole to help clear the inverted flair inside the transmission fitting. To check the length, I assembled the fitting minus one washer. I was able to screw it together (without one washer) until it was almost snug. This tells me that there's no chance of the bolt bottoming out before the fitting is tight once both washers are in place.